Last week we discussed God’s purpose for the suffering we endure in this world. Suffering, in its grand scheme, helps us to look beyond ourselves and see an All-knowing and wise Creator who cares for and comforts those who place their trust in Him for eternal comfort from this sinful world. While this knowledge consoles many, such experiences were never meant to give us a genuine hope. No, it was our risen Savior, who suffered at the hands of this sinful world through whom we enjoy a genuine hope for eternal comfort. The apostle Paul knew this both from a conviction he long held before coming to know Jesus as the Christ (Acts 23:8), but also because as a hostile enemy of the Lord’s church, witnessed with his own eyes the resurrected Jesus (Acts 9:1-9; Acts 8:3). Because of this he said to the church at Corinth. “Moreover, brethren, I declare to you the gospel which I preached to you, which also you received and in which you stand, by which also you are saved, if you hold fast that word which I preached to you—unless you believed in vain. For I delivered to you first of all that which I also received: that Christ died for our sins according to the Scriptures, and that He was buried, and that He rose again the third day according to the Scriptures, and that He was seen by Cephas, then by the twelve. After that He was seen by over five hundred brethren at once, of whom the greater part remain to the present, but some have fallen asleep. After that He was seen by James, then by all the apostles. Then last of all He was seen by me also, as by one born out of due time. For I am the least of the apostles, who am not worthy to be called an apostle, because I persecuted the church of God. But by the grace of God I am what I am, and His grace toward me was not in vain; but I labored more abundantly than they all, yet not I, but the grace of God which was with me. Therefore, whether it was I or they, so we preach and so you believed. Now if Christ is preached that He has been raised from the dead, how do some among you say that there is no resurrection of the dead? But if there is no resurrection of the dead, then Christ is not risen. And if Christ is not risen, then our preaching is empty and your faith is also empty. Yes, and we are found false witnesses of God, because we have testified of God that He raised up Christ, whom He did not raise up—if in fact the dead do not rise. For if the dead do not rise, then Christ is not risen. And if Christ is not risen, your faith is futile; you are still in your sins! Then also those who have fallen asleep in Christ have perished. If in this life only we have hope in Christ, we are of all men the most pitiable. ” (1 Corinthians 15:1–19, NKJV)”. The fact and reality is that Jesus died, then rose from the dead according to prophetic scripture and is the reason why we have such a hope that we declare the glorious gospel to the lost. 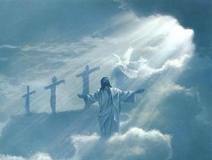 It is through our risen Savior we can trust God to get us through this suffering world, on to a better home. A place where there is no more sorrow and shed tears. Amen.